Bengtskär is a small, rocky island with an area of about 1.5 hectars. 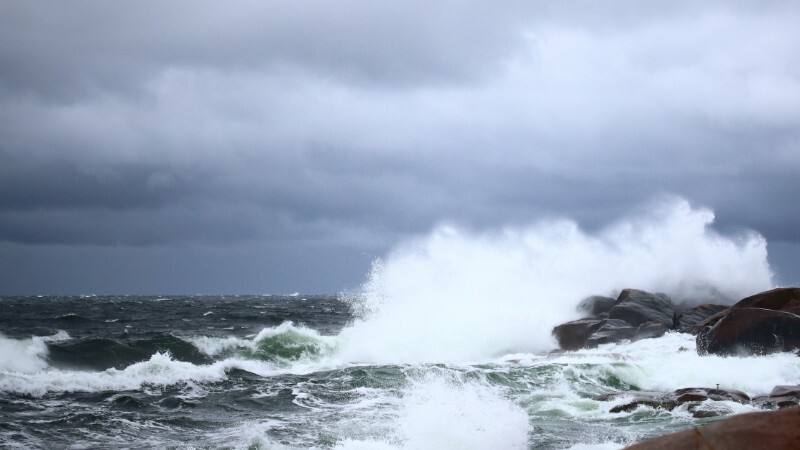 In harsh weather, waves sometimes wash over the whole island. Because most of the surface is rock, the island can tolerate lots of wear from visitors. Plants can only grow in places that have been covered in soil. The first soil was brought when the lighthouse was built, ”for the lighthouse keepers’ wellbeing”, according to preserved documents. No trees grow on the island, but there is low vegetation which allows the eiders to build their nests. There is no well on the island. Rainwater is collected in a large cistern and is used for washing. The water should be used as sparingly as possible. On Bengtskär there is there is a new, very environmentally friendly waste water treatment plant. The plant began operating in autumn of 2017. Organic waste is composted, and other waste is sorted and taken to different disposal sites in the archipelago. Bengtskär is not connected to the grid, so all electricity is produced on the island with generators. Conserving and efficient use of electricity is very important to us. On Bengtskär, we’ve found that man is the eiders’ best friend. When the white-tailed eagle became endangered in the 1970s, the World Wildlife Fund began feeding the birds during winter by placing meat on small islands in the archipelago. Thanks to the feeding, which lasted 20 years, the population has rebounded so well that the eagles are no longer endangered. You could almost say they’re overpopulated now. In recent years, scientists have warned that the eider population has dropped catastrophically in the archipelago. The female eiders, who build their nests in unprotected places, are easy prey for the eagles, and the eggs and ducklings are tasty mouthfuls. The eagles have no natural enemies, but they are afraid of humans. That’s why the eiders can find shelter in places where the presence of humans keeps the eagles away. Bengtskär is one of these places. Before the renovation of the lighthouse began, there were 3-5 nesting eiders on the island each year. After Bengtskär opened in 1995 as a museum and visitor lighthouse, the number of nesting birds began to increase. 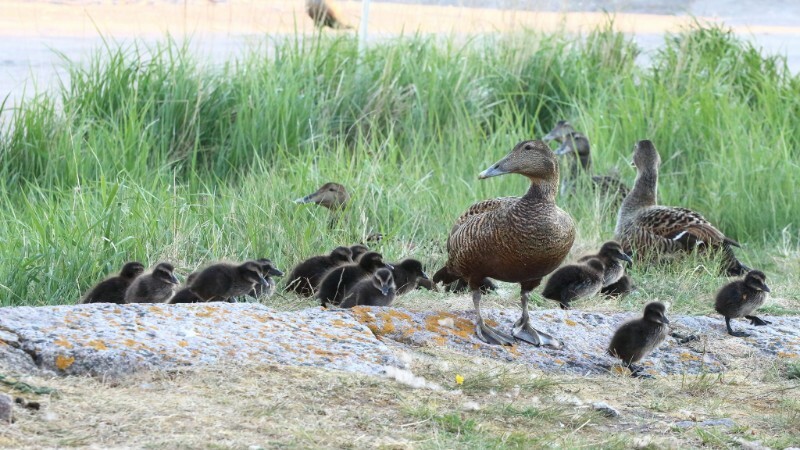 In the spring and summer of 2018, there were about 400 nesting eiders on the island, and the number of ducklings hatched was more than 1000. 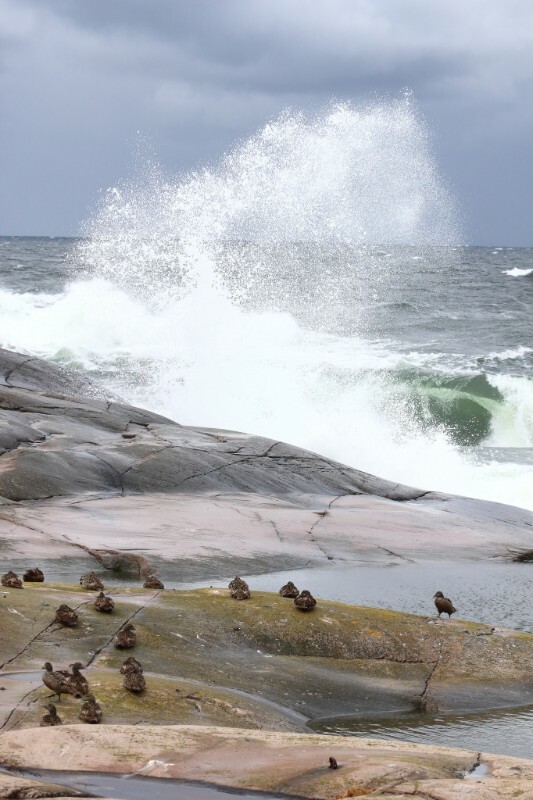 Over the last 20 years, the eiders have learned that it is safe to build their nests on Bengtskär. 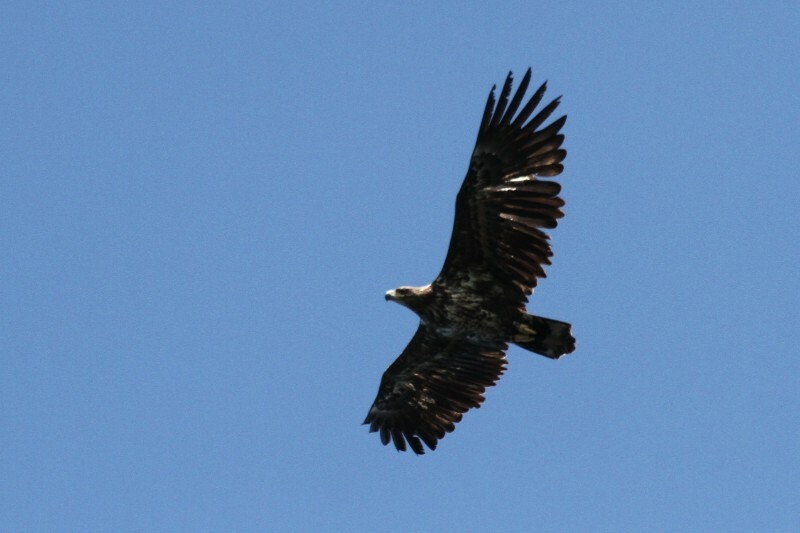 In addition to eagles, they are protected from gulls, crows and minks. 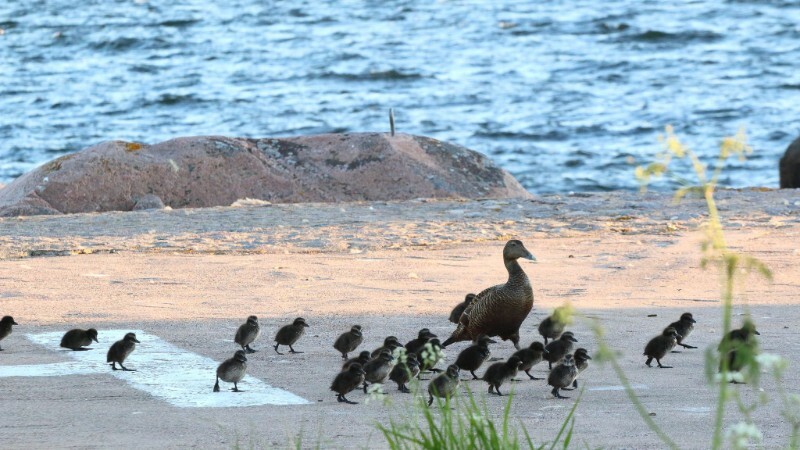 In recent years, the eiders have begun to stay near Bengtskär even after the ducklings have hatched. Both females and ducklings come up onto the rocks in the evening, where the ducklings crowd together in large dark mounds while the females guard them. As an eider island, Bengtskär is unique in the world. 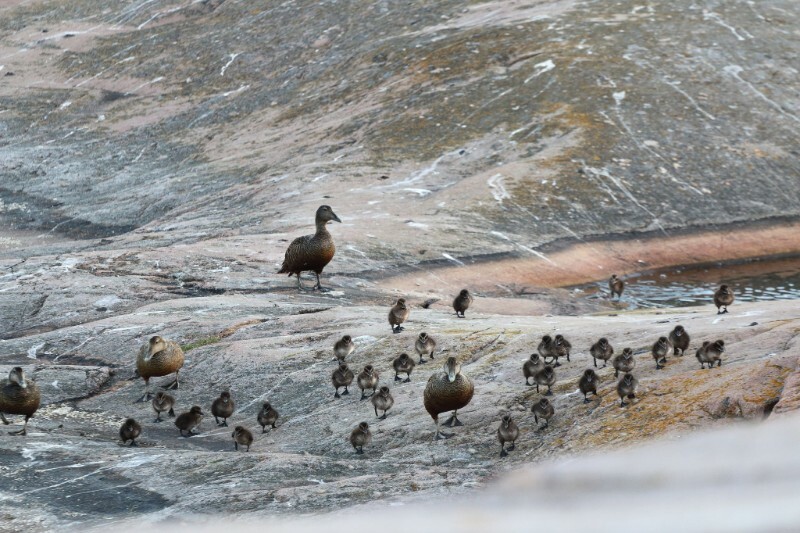 In May and the beginning of June, interested visitors can visit Bengtskär on “Eider tours” from Kasnäs. The eiders are not tame and must be respected in order not to interfere with the breeding. You should not go too near them, and should absolutely not touch them or their ducklings, but you can generally observe and photograph them from a few meters away. You are welcome to experience a spring or early summer’s day on Bengtskär with the nesting eiders!